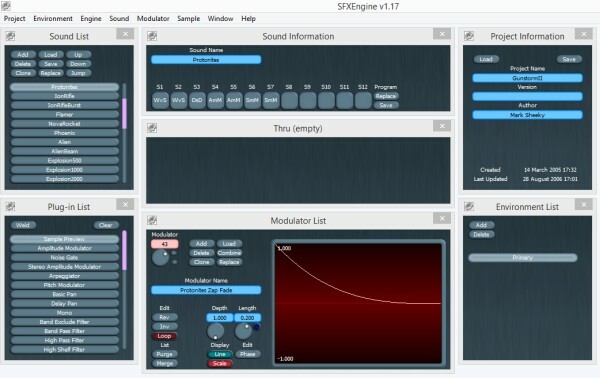 SFXEngine is powerful sound creation software for Windows PC's, perhaps the only software in the world designed to develop new sound effects in a procedural, multi-layered way. Using a plug-in based synthesis system, you can use SFXEngine to quickly and easily create any sound or add new audio effects to existing sounds. Like filters in graphics programs, the engines in SFXEngine are plug-in files that create or manipulate sound in some way. The Sample engine will play a sample of your choice, and the Nitroverb engine will add reverb. Up to twelve engines are placed in series to make a program. All of the engines use unique custom algorithms, so you won't find the silky smooth Oxyverb reverb anywhere else. Modulation is power. Every engine in SFXEngine has a number of parameters, the Low Pass Filter engine for example has Cutoff frequency as a parameter. What makes SFXEngine so powerful is that any parameter can be modulated. Modulator waves are wav files, so it's easy to design your own. Environments give you another layer of processing. Using another set of engines, you can apply the same audio effects to all of your sounds. You might create a cavern environment, or a tunnel environment. You can add as many environments as you like to a project, and naturally you can load and save environments between projects. Batch processing is no problem in SFXEngine. When you're ready to save out all of your sounds, the render option will save each one as a wav file. You can specify which Environment to use and whether to save all of your sounds or just one. You can save stereo or mono files, in 44100, 22050 or 11025hz, and sounds are optionally trimmed to zero so there is no need for further editing. SFXEngine was sold here, and under licence by The Game Creators for a short period. It has been continually updated since but not distributed. Existing customers should email me to ensure that I have their details on file, should the latest version of SFXEngine be commercially published again.